We always like to check out an online slot that looks a little different so we’re pleased to bring you this review of Tiger Rush, a low-key big cat-themed release from Thunderkick with some clever features – find out how it works below. Tiger Rush is a five reel slot with three rows and ten fixed paylines in the base game; there’s a hazy forest backdrop to those reels which are encased in a green, vine-like frame. The two higher value symbols are pictures of birds and flowers; the lower values are represented by jewels of various colours – yellow, green, red, blue and purple – etched with assorted plant life. The tiger is of course wild and he will substitute for all others to help form winning combos except for the Tiger Rush scatter symbol; there’s also a feature associated with the tiger which is explained below. The wild tiger appears only on reels two, three and four but whenever it lands it will cover the whole of that reel; it will also award one free spin with that wild reel frozen in place. 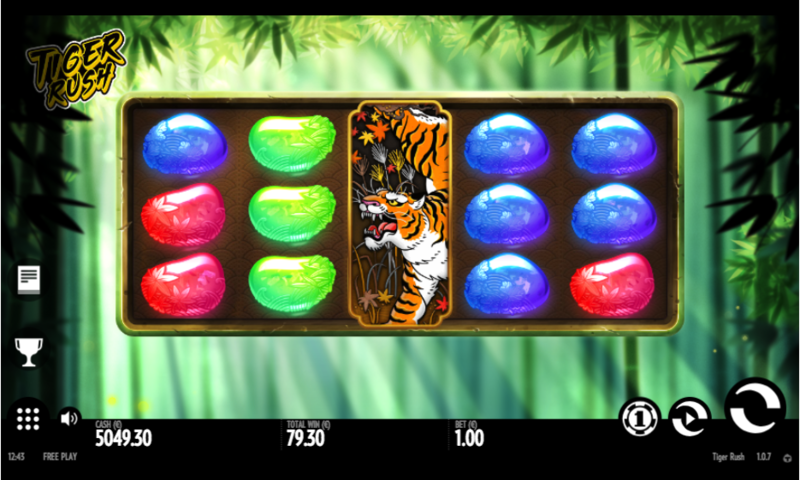 The Tiger Rush scatter symbol appears only on reels one and five and the free spins are triggered by landing two of these scatters or one scatter plus an adjacent wild symbol. Each individual triggering combo can earn five spins which means there are twenty available for the luckier players. As you can see from the video above, the reels change to a 3, 5, 5, 5, 3 structure with an increased number of paylines – twenty five. The Tiger Wild is active during the free spins and wins can be formed from right to left as well as left to right. 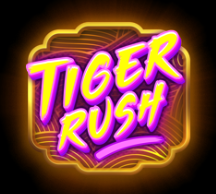 Tiger Rush is an eye-catching slot with some unusual graphics and smooth gameplay; the design may seem basic but there’s plenty going on here once you’ve pressed the ‘Spin’ button and some big wins available during the free spins. There’s an RTP of 96.30%.